1 What Is Trigeminal Neuralgia? If you’re suffering from a severe form of unexplained pain in your face and head, you may be suffering from trigeminal neuralgia. Here’s what you should know about this condition and how to treat it. Based on what patients report, some researchers believe that trigeminal neuralgia pain may be some of the worst you can experience. Trigeminal neuralgia pain relates to the trigeminal nerve in your head, or one of its branches. 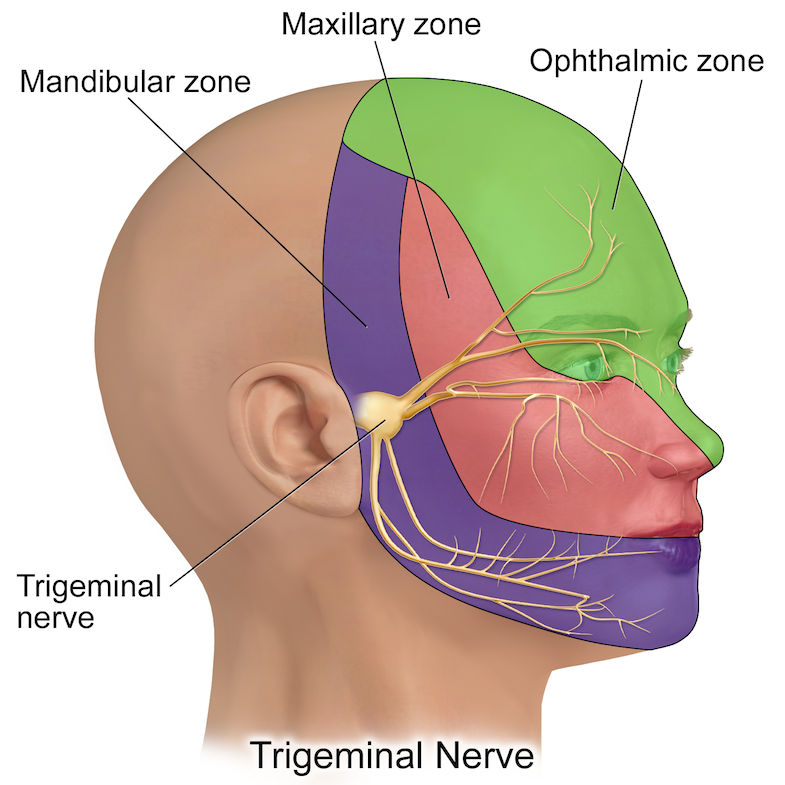 As you can see in the following diagram, the trigeminal nerve crosses your face. It transmits impulses from the nerves in your face to your brain. Pain occurs from damage or inflammation in an area of this nerve. With trigeminal neuralgia, you’ll experience chronic pain in this region that can be caused by even slight stimulation to your face. Often, people suffer from excruciating, unbearable pain from the simplest triggers. The exact source of trigeminal neuralgia is unclear. In some cases physicians may be able to trace it back to an earlier injury or damage to the nerves. Many people with trigeminal neuralgia are incorrectly diagnosed with migraines. The two conditions share some symptoms, but they’re not the same. People who suffer from both conditions may experience sensitivity to light and sound, nausea, or vomiting. Migraine headaches are unbearably painful and are typically felt one side of the head behind the eye, thought. A large portion of migraines happen on just the left or right side of the head. Approximately 16% of adults in the United States suffer from migraine headache. Migraines will typically last for a few hours or longer. Head pain linked with trigeminal neuralgia, on the other hand, is commonly sporadic and short-lived. While environmental triggers do contribute to migraines (such as weather or diet) they’re not directly linked to tactile triggers. With trigeminal neuralgia, you may feel pain from simply wiping your face or running a shower jet over it. Those who suffer from trigeminal neuralgia are typically women between the ages of 18 and 44 years. The cause trigeminal neuralgia pain is the result of injury to the trigeminal nerves. When we say injury, this could mean inflammation, damage, or some other traumatic event. In one theory, researchers are exploring the idea that trigeminal neuralgia results from the deterioration of the protective layer surrounding the trigeminal nerves. This explain the cause of pain in instances where a doctor is unable to find any other reasons for the condition. Trigeminal neuralgia treatments vary from patient to patient, depending on the underlying cause of their pain and severity. While some patients may be able to manage their pain with lifestyle changes and avoidance of triggers, others may need medications to manage their severe pain. Always talk to your doctor about all of your options and follow their guidance for treatment. If your trigeminal neuralgia stems from an inflammatory response, non-steroidal anti-inflammatory medications (NSAIDs), such as aspirin or naproxen, may be your first-line treatment. You can use these during acute attacks to manage pain. The use of these medications appears to be more effective in people who experience episodic pain episodes on ten days or less per month. Since NSAIDs may result in organ failure when they are used consistently over a long-term period of time, they’re not an effective long-term treatment approach. Carbamezapine, an anti-seizure medication, may also be help with intermittent pain episodes. This medication has more significant side effects, including skin irritation, allergic reactions, and toxic epidermal necrolysis. Your doctor will screen you for your personal risk factors before advising this approach. As noted above, the trigeminal nerve splits into three divisions. These divisions unite into a single grouping behind the eyes. The group of nerves is called the semilunar ganglion or trigeminal gasserian. In some cases, your doctor may be able to target this area using minimally-invasive surgical treatments. By doing this, they may be able to reduce or completely relieve severe pain that has not responded to more conservative treatments. Radiofrequency ablation, for example, is an option. By inserting a thin probe through the nose or mouth, your doctor will be able to target certain nerves and discharge an electro-thermal impulse. This can selectively eliminate the nerve tissue that is responsible for the pain signals. Radiofrequency ablation can result in pain relief for many patients. The risks related to this procedure are infection, the potential for reduced sensation or motor control in the facial area, and discomfort with the insertion of the probe. You can avoid some of these risks by working a doctor who is highly-skilled with this treatment approach. Even so, some individuals may experience pain with the insertion of the surgical probe. If successful, this treatment can help manage your pain for a few months up to a year. You can learn more about radiofrequency ablation in the following video. Trigeminal neuralgia results in extreme facial pain that can be triggered by the slightest touch. It stems from a disorder of the trigeminal nerves that enervate the face. Treatment may include lifestyle changes or medications. If these treatments fail to bring about sufficient pain relief, other more invasive procedures may help you achieve pain relief. If you’re suffering from trigeminal neuralgia, a diagnosis is your first step. A pain doctor can help. You can find a pain doctor in your area by clicking the button below or looking for one in your area by using the tips here: https://paindoctor.com/pain-management-doctors/. Smitherman TA, Burch R, Sheikh H, Loder E. The prevalence, impact, and treatment of migraine and severe headaches in the United States: a review of statistics from national surveillance studies. Headache. Mar 2013;53(3):427-436. Buse DC, Pearlman SH, Reed ML, Serrano D, Ng-Mak DS, Lipton RB. Opioid use and dependence among persons with migraine: results of the AMPP study. Headache. Jan 2012;52(1):18-36. Chogtu B, Bairy KL, Smitha D, Dhar S, Himabindu P. Comparison of the efficacy of carbamazepine, gabapentin and lamotrigine for neuropathic pain in rats. Indian journal of pharmacology. Sep 2011;43(5):596-598. Lainez MJ, Garcia-Casado A, Gascon F. Optimal management of severe nausea and vomiting in migraine: improving patient outcomes. Patient related outcome measures. 2013;4:61-73. Lipton RB, Serrano D, Nicholson RA, Buse DC, Runken MC, Reed ML. Impact of NSAID and Triptan Use on Developing Chronic Migraine: Results From the American Migraine Prevalence and Prevention (AMPP) Study. Headache. Nov 2013;53(10):1548-1563. Ducros A. [Familial and sporadic hemiplegic migraine]. Revue neurologique. Mar 2008;164(3):216-224. Edlich RF, Winters KL, Britt L, Long WB, 3rd. Trigeminal neuralgia. Journal of long-term effects of medical implants. 2006;16(2):185-192. Weng Z, Zhou X, Liu X, Wei J, Xu Q, Yao S. Perioperative pain in patients with trigeminal neuralgia undergoing radiofrequency thermocoagulation of the Gasserian ganglion. The Journal of craniofacial surgery. Jul 2013;24(4):1298-1302. Cheng JS, Lim DA, Chang EF, Barbaro NM. A Review of Percutaneous Treatments for Trigeminal Neuralgia. Neurosurgery. Sep 23 2013.